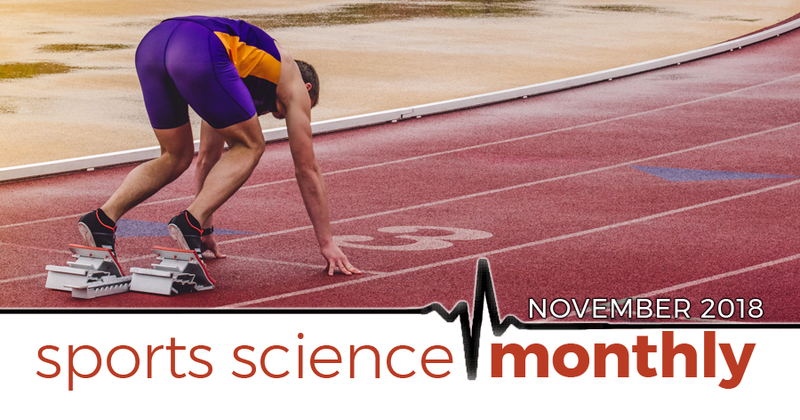 We cover a wide range of topics in the November edition of Sports Science Monthly. Our first report looks at new research providing some interesting insights into reaction times of Olympic sprinters. We also look at research on several supplements including creatine and caffeine, the connection between testing and performance in team sports, as well as deceleration and injury prevention. » Quick summary: Women tend to have slower reaction times than males, but the reason why is unknown. A 2011 paper suggested this was to do with the force threshold set by the starting blocks to detect a false start, which, because women are weaker than males, leads to slower measured reaction times. However, this male/female difference appears to have disappeared, suggesting that starting block manufacturers use different thresholds for males and females in the latest versions of their technology. Reaction time is a small but important aspect of the sprint race. In some cases, it can be the difference between success and failure, as demonstrated at the 2017 World Championships, where the difference between third-place finisher Usain Bolt’s 100m time in the final (9.95), and the winner’s, Justin Gatlin (9.92), was less than the difference between their reaction times (0.183 for Bolt; 0.138 for Gatlin). If Bolt had the same reaction time as Gatlin, he likely would have won. Given that the reaction time is one of only two pieces of data we get from the official race results—the other being the finish time—it is often examined in detail. The purpose of reporting the reaction time is to guard against false starts, with a fairly arbitrary value of 0.1 seconds (100ms) being set as the threshold; a reaction time below this is deemed to be a false start (for a great article on this, check out Bas Van Hooren’s site). Determining whether a false start has occurred is actually quite a complex process, much more so that you might imagine. It tends to involve the measurement of force against the blocks by the sprinter, and if this rate in change of force reaches a given threshold before 100ms after the gun has been fired, a false start is said to have occurred. As such, electronic starting blocks do not measure reaction time per se, but rather the time taken for the sprinter to produce a set amount of force. Frustratingly, the companies that provide the false start detection systems don’t publish what this threshold is (and don’t respond to requests from researchers). Even more frustratingly, with Seiko providing the equipment for the World Championships, and Omega for the Olympics. It’s likely that each company has different force thresholds for determining a false start, which can make comparisons between reaction times at the Olympic Games and World Championships hard to compare. To that end, researchers tend to focus on analyzing data from either the Olympic Games or the World Championships. It was in an analysis of reaction times at the 2008 Olympic Games, published in 2011, that researchers noticed something interesting; on average, the women were reacting slower than the males, with a median reaction time of 0.168 for the males and 0.189 for the females. This is surprising because there isn’t really any good reason why this would be the case; indeed, we might expect females to have shorter reaction times, given that there is less distance for the nerve impulses to travel. Women are, on average, weaker than males, however, which lead the authors of that analysis to speculate that the reason for the slower reaction times in females was due to the fact that it took them longer to reach the force threshold required to be measured as a reaction time. This has important implications, namely that due to the same force thresholds being used for male and female sprinters, and that female sprinters took longer to reach this threshold, it was possible that many female false starts were going undetected. Based on their findings, the authors recommended that Omega should reduce the force threshold for female sprinters by around 22% in order to correct for this force deficit. Earlier this year, a study by the same research group was released, this time examining reaction time data from all the Olympics since the false start disqualification rules changed in 2003 (so 2004, 2008, 2012, and 2016). What they found was that average reaction times had gotten quicker from 2004 to 2016. However, closer analysis showed that men were reacting with more or less the same speed across this period, whilst women were reacting quicker, driving the average time down. In both 2004 and 2008, women reacted slower than males, whilst in 2012 and 2016, this wasn’t the case. Interestingly, the race times for females were not significantly quicker as the Olympic Games progressed. If females were reacting quicker, you would expect them to finish quicker too, but this isn’t the case. Instead, the authors suggest that Omega have altered the force thresholds for females only, such that they are not actually reacting quicker, but instead reaching the required force threshold sooner. However, we don’t know whether this is case, because Omega view the force threshold as proprietary information, and so won’t release it. This is an important demonstration of the impact of technology on performance, illustrating how changes in the system used can appear to affect performance.